Christmas is coming! 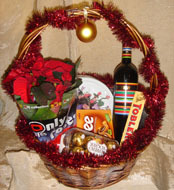 Surprise your relatives, friends, colleagues, business partners or just someone you want to feel special on Christmas Eve. 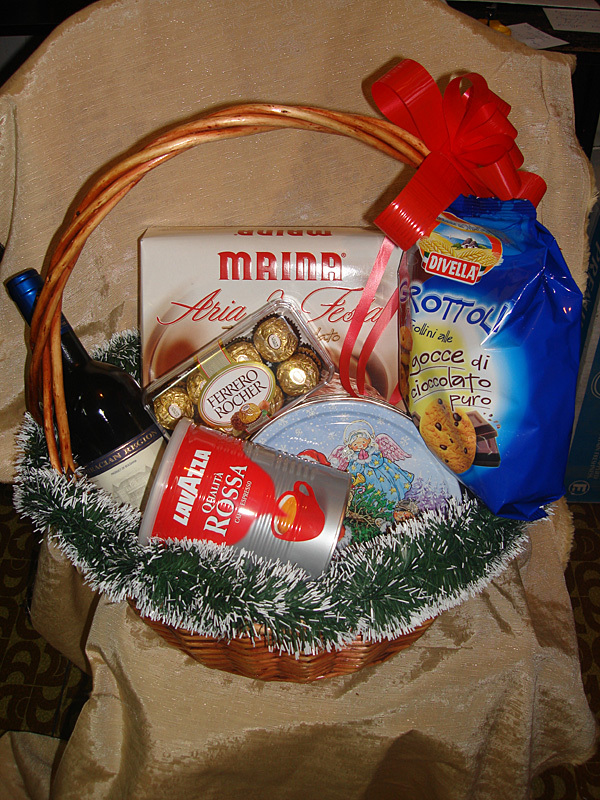 We offer Christmas baskets filled with goodies, gourmet and Christmas mood. Are you tired of sending flowers? 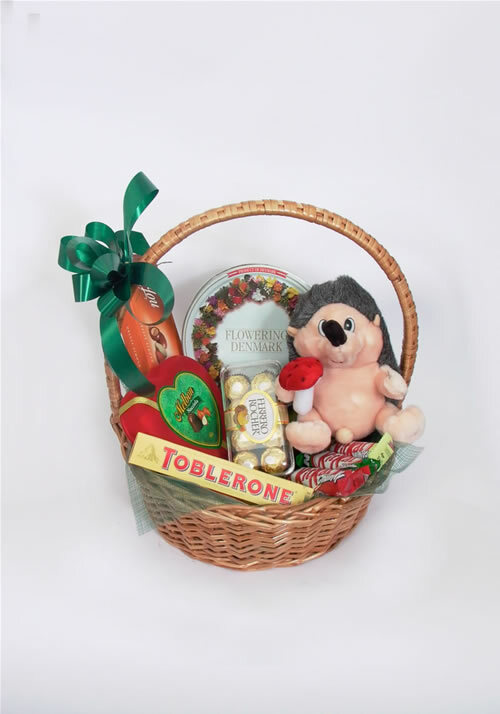 Do you want to surprise someone with something nice and interesting? 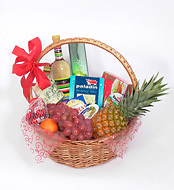 Do you want to send a basket full of selected wines, cheese, appetizers and deserts? 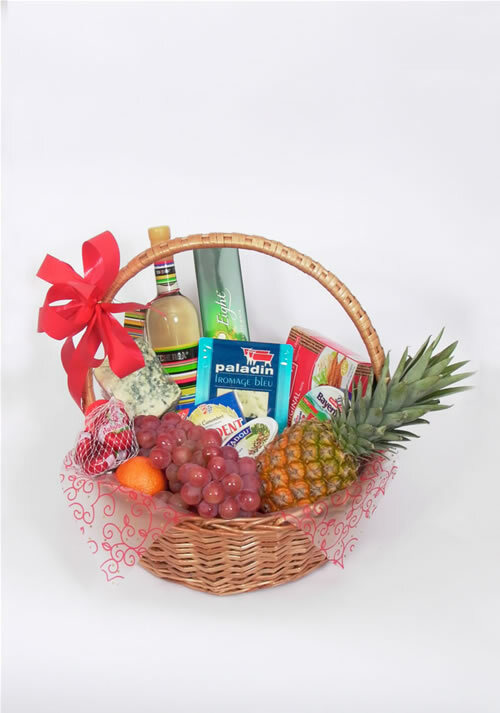 We are ready to prepare a unique basket assembled according to your taste! Then contact us! Fruktmix is already here and will fulfill all of your desires. 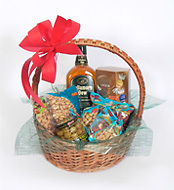 You can send the gift basket to your loved one, your parents, friends or someone who has a birthday. Or why not to your clients, or for your staff who have done a great job. 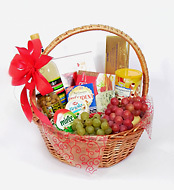 Fruktmix's gift baskets are perfect for companies, as well as for private individuals. 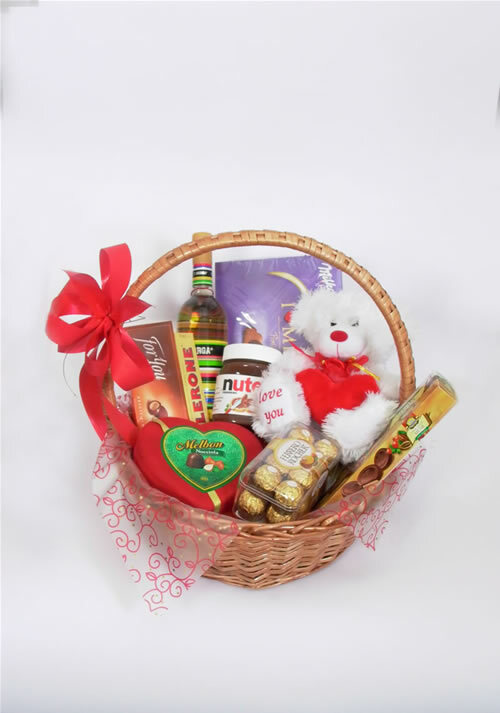 The gift baskets are wrapped in cellophane and arranged with appropriate decoration. Christmas Star flower in pot. A bottle of red wine "Rug" 750 ml. 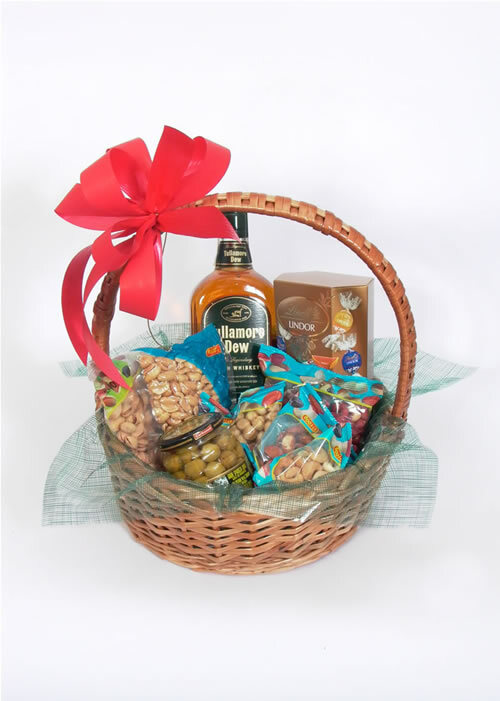 A bottle of red wine boutique Mavrud Todorov 750ml. 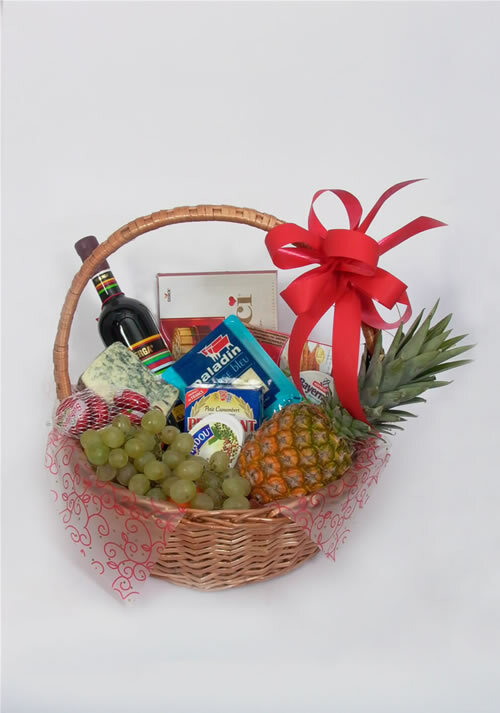 450 g chocolate Christmas cake "MAINA"
The basket is decorated with Christmas decorations and is completely wrapped in cellophane and ribbon. There is also a greeting card. Bottle of Whisky Grants Family Reserve 750ml. 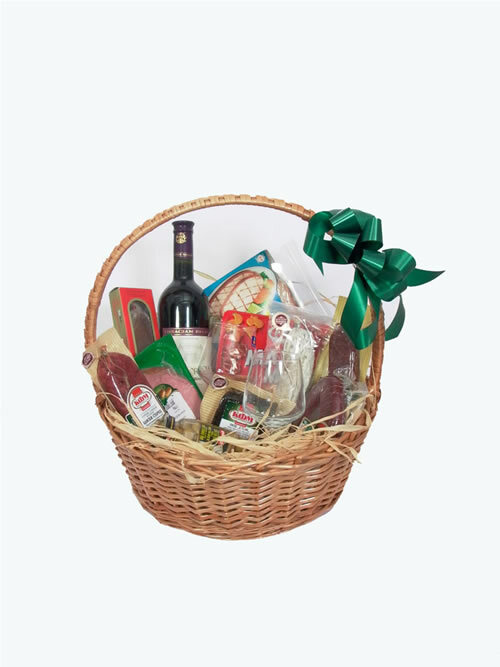 A bottle of wine Rug 750ml. A bottle of white wine Rug 750ml. 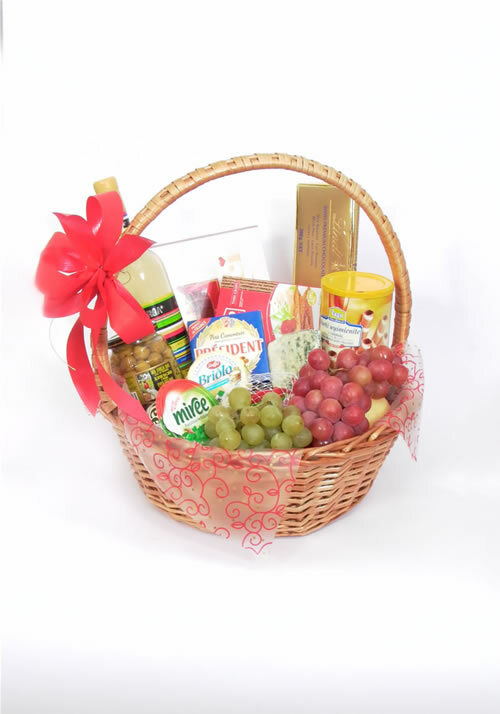 160 g green olives "CRESPO"
A bottle of red wine "Tcherga"
a box of small chocolate bars "Merci"
a bottle of white wine "Tcherga"
biscuits "Big Family" - 500 gr. chocolate bonbons "Toffifee" - 125 gr. a box of colorful biscuits "Bisca" - 400 gr. bonbons "Ferrero Rocher" - 200 gr. 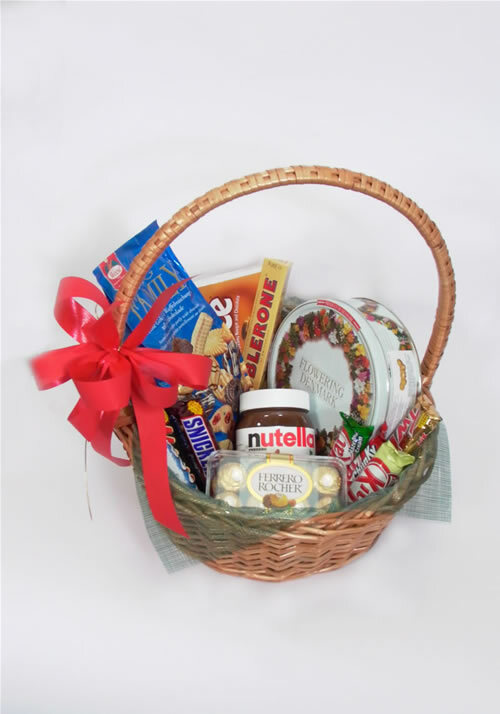 chocolate spread "Nutella" - 400 gr. candy bar "Toblerone" - 100 gr. 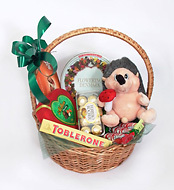 Basket To Say "I Love You"
chocolate bonbons "I LOVE-Milka" - 120 gr. bonbons "Ferrero Roche" - 200 gr. chocolate drops - almond "FOR YOU" - 130 gr. heart shaped chocolate bonbons "Nocciola" - 110 gr. 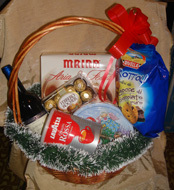 a box of biscuits "Muse" - 120 gr. 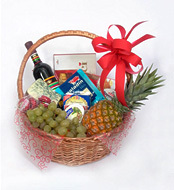 Basket "Welcome to This World"
Basket "Big Fat Thank You"
wafer cigars "Tago" - 220 gr. Irish whiskey "Tulamore Dew" - 700 ml. 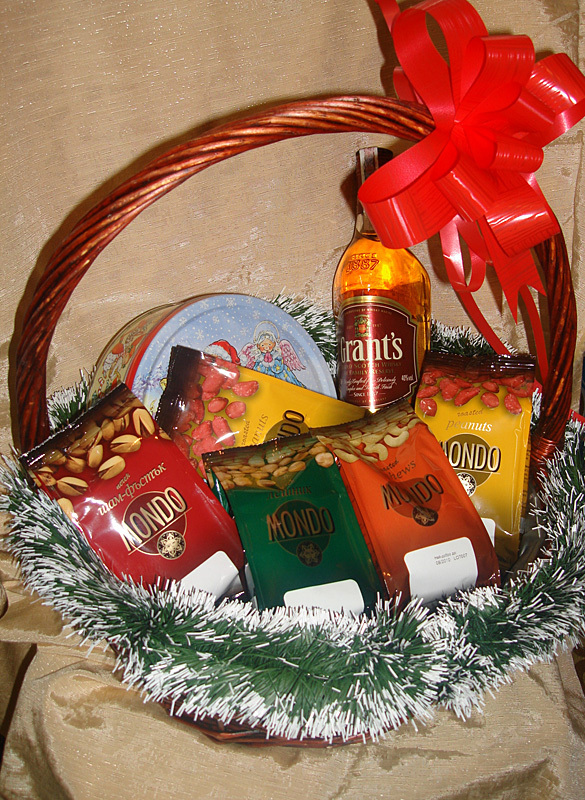 roasted peanuts - 250 gr. 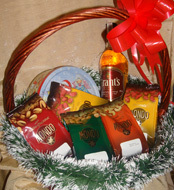 fried peanuts - 200 gr. 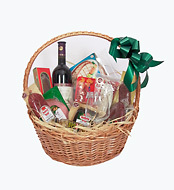 green olives "Carbone" - 210 gr. 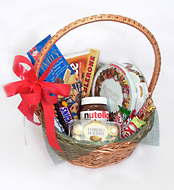 Lindt - Lindor Cornet - 200 gr. 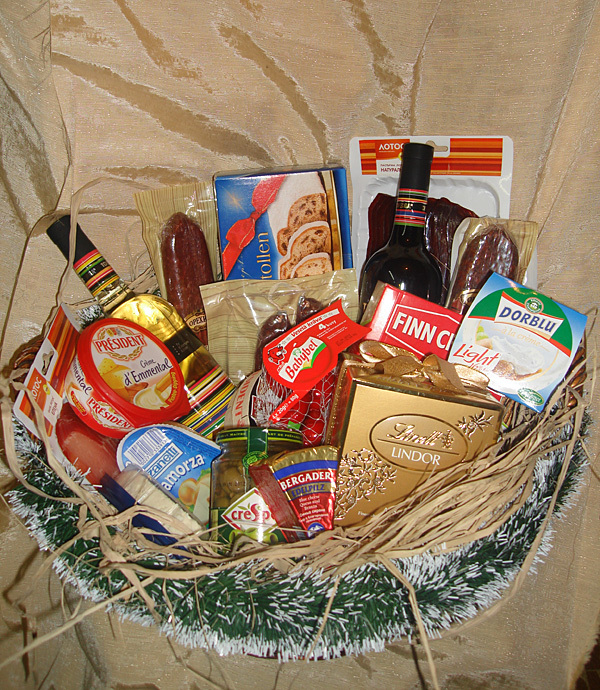 bottle of red wine "Todoroff"
flat sausage in a box - "Karlovska" - 250 gr. 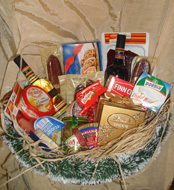 dry sausage - "Pirinska" - 180 gr. horseshoe shaped flat sausage - 280 gr. flat sausage from Bansko - 300 gr. salchichon - mini - 300 gr. fillet "Elena" - 250 gr. smoked turkey filet - 200 gr. smoked veal filet "Da Vinchi" - 220 gr. crackers "Maxi Mix" - 250 gr. wine glasses - 2 pcs. © 2011 Х - Rhino LTD. All rights reserved.